Gerardo Del Real: This is Gerardo Del Real with Resource Stock Digest. Joining me today is Brien Lundin. 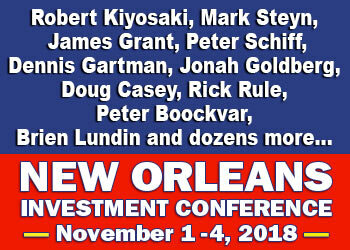 Brien is the publisher of the Gold Newsletter and host of my favorite conference, the New Orleans Investment Conference, which this year will take place I believe between November the 1st and November the 4th. Brien, is that correct? And thank you ahead of time for joining for today. Brien Lundin: That's absolutely correct, Gerardo. It's my pleasure to be with you again and I look forward to catching up in a few weeks. Gerardo Del Real: Likewise. The lineup is always fantastic. This year is no exception. Aside from the many great companies that will be there, Robert Kiyosaki will be there. James Grant will be there. Doug Casey, of course, will be there. You have a pretty stellar lineup. Can we talk about the makeup of the lineup? It's very interesting geopolitically right now. Why those speakers? If I missed a couple of names that are worthy of mentioning, please, please update the listeners. Brien Lundin: Sure. We also have a couple of geopolitically oriented speakers like we have every year. We have Mark Steyn back. He was last here a few years back, and he was a huge hit, a very entertaining, very insightful speaker. We also have Jonah Goldberg, who had his debut at the New Orleans Conference last year, and he was also a really big hit, very funny. I think he's just the best thinker in the conservative/libertarian movement out there right now, so he's another great speaker we have. And Peter Schiff, Doug Casey, Rick Rule, Nick Hodge, Dennis Gartman, you. The list goes on and on. We've got all the gang back. I just think there's not a better time – or there hasn't been a better time for many years, probably not since certainly late 2015 when the market was about to turn. We had a lot of opportunities to make money back then, but I think we have the makings of, perhaps, the next big run in gold right now. So it's the perfect opportunity to analyze the trends, see what everyone’s thinking about the metals, gold, silver, all the other base metals, see if we really have a turnaround coming up, but also what the top picks are in the companies, the junior mining stocks. We've seen some action here and there, some discoveries. Even on that big run we had last week in the metals, a lot of these resource-rich juniors went up 10, 15% in a day. And yet they're still so dramatically undervalued that people just really need to get positioned in the sector now in my opinion, and there's no better way to do it than with the one-stop shop that the New Orleans Conference represents. Gerardo Del Real: Well said, Brien. The last time you and I spoke, I asked you about the geopolitical flashpoints that were going on at the time, and you said that, typically, you would be in direct opposition to giving that credence and actually believing that that would serve up as a catalyst for the gold price to run. You mentioned just now that you feel that the setup is as good as you've seen in quite some time. Why do you feel that way, Brien? Brien Lundin: First, on the geopolitical issue, I just don't believe that's a long-term driver for metals prices, for gold prices and silver prices. I think the only way you get a longer term, strong, consistent, classic bull run in gold and silver is if there are monetary issues involved, specifically the ongoing or anticipated depreciation of the currency. And that's precisely what we're seeing here. In the U.S., the Fed, any way you look at it, is in the process of winding or about to begin to wind down its rate hike program. We have, even by the Fed's estimates, only about three or four rate hikes left. That means, sometime next year, it's very likely that they're going to stop their rate hikes. At the same time, we have the ECB beginning their tapering program this fall. The Bank of England will soon begin theirs. So these other central banks are about to begin their tightening programs, their rate hike programs, precisely when the Fed is winding down theirs. So that's a recipe for dollar weakness and not strength, and I think the smart money is already realizing that. That's just one of the many factors I think that argue for higher gold prices in both the near and the long term. Gerardo Del Real: I think it's a great point, and let me get you to elaborate a little bit further. Do you feel the tightening and the rate hikes are sustainable? Because I certainly don't, I believe frankly it's the central bank’s way of reloading and doing it while they can before we get QE till infinity. I'd love to hear your thoughts, Brien. Brien Lundin: I absolutely agree. They know that a recession is coming. Nobody knows when. Nobody particularly knows why, but it's going to come. It's inevitable, if it's not imminent, but the Fed is desperate to get rates up enough so that they can influence the economy by cutting rates. Now, typically, the average rate cut by the Federal Reserve in the face of a recession is five points. That's not basis points. Five full percentage points. And the minimal cut to have any real effect on the economy is thought to be around three percentage points. We're not even up to three points right now, and there's no way they can even get the Fed funds rate up to where they could cut the average amount. The debt in the U.S. right now is so large and, with rates rising, the burden of servicing that debt is so large and growing that we can never have so-called normal or normalized interest rates again. If the cost of servicing the debt gets up to, say, 5%, which it was in the early 2000s. Brien Lundin: If the cost of servicing the debt gets up to around 5%, just the interest on the debt is $1.2 trillion. Now, that dwarfs the current deficit in whole that we have right now. That dwarfs any spending we have for entitlements. That dwarfs any spending we have for defense. At that point, it becomes a political impossibility. At that point, people start talking about a major devaluation of the dollar or even a default on the debt. So that's the longer-term future that I see. We don't know what the timing is for something like that, but we know at this rate it’s nothing short of inevitable. I think more and more people are going to realize that, and that's one of the reasons why we're seeing more interest in the metals. Gerardo Del Real: Speaking of not knowing when something is going to happen, we know that the setup for a commodity bull market, specifically in the junior resource space for me anyway, is as good as I've seen. It's a contrarian's dream. However, if you invested in 2016 and 2017, and you spread your money around through 10 to 20 companies, a lot of those companies aren't faring so well. Despite that, exploration is absolutely back. You've had some big wins recently, Brien. Can we talk about some of the better stories that you're following, companies that have caught your eye and maybe companies that will be in New Orleans here in a couple of weeks? Brien Lundin: Absolutely. If you look at the recent record in junior mining stocks, the big story recently has been Great Bear Resources (TSX-V: GBR). We were, if not the first, then I think maybe the second newsletter, in Gold Newsletter, to recommend that stock. Yesterday, we were up about 10 times from our recommendation in December, about 6 times from our recommendation of the stock in early August. After a run like that – and keep in mind that I'm a shareholder, I own that stock – but after a run like that, it’s really hard to recommend buying it at these levels. But the fact remains that there's no other junior company out there that has the kind of upside that Great Bear has. It controls a potential strike length of mineralization, at least geologically or structurally identified strike length, of over 10 kilometers in the Red Lake District. It took about a strike length of about 7.5 kilometers of the Red Lake District to produce about 30 million ounces of gold. Obviously, that's major league arm waving. Nobody's even hinting that they have something like that, but there's no other company that has that kind of upside potential. It's just a very exciting story that I think even from these levels is going higher. Gerardo Del Real: I think it's a testament to the team. They have an excellent share structure. They've managed to keep that tight. Gerardo Del Real: They're well-financed. Their technical expertise is topnotch. Congratulations to Great Bear and the team because, at a time where a lot of exploration companies are just collecting checks and not actually exploring, they put money in the ground and then got out there. Good for them and good for you and your subscribers, Brien. Brien Lundin: Yeah, and it's a classic textbook case of doing it the right way and how powerful these gains can be in junior mining stocks when it all comes together. So yeah, they did it all very well, great management team, great structure, and a big discovery. We're glad to be in that one. Gerardo Del Real: Absolutely. Brien, I can't wait to get out to New Orleans and catch up. I'm looking forward to the conference. Where do people go to register and sign up if they haven't yet? Brien Lundin: Neworleansconference.com, very simply. You can get all the information on our speakers, on the agenda. Everything's up there, and I'm sure we have the link for you, Gerardo, as well that you can put up that will probably get them a special opportunity, a special deal, so we'll make sure you have that as well. Click here to register for the 2018 New Orleans Investment Conference. Enter promotional code FREEGOLDCLUB for a free Gold Club upgrade for you and your guests. A $189/person value, your Gold Club status will entitle you to a special private viewing room with day-long coffee service, exclusive Q&A sessions with selected speakers following their presentations, special reports and investment information exclusively for you, and deep discounts on conference audio and video recordings and other valuable investment products. Gerardo Del Real: Fantastic, and can we talk about Gold Newsletter? You mentioned Great Bear. I know you have a lot of good picks. If people want to sign up or kick the tires there, how do they find you? Brien Lundin: Yeah, very simply, goldnewsletter.com. I've been in this business for a few decades now, and I can tell you there's really only about a half dozen newsletters out there that are really good in the sector, really cover it well, get tomorrow's biggest winners today. I think your letter, Nick's letter, obviously I believe my letter is, and a few other ones as well. And I think that people who are serious about the sector really need to subscribe to all of them and compare notes. That's one way they won't miss the next big winner. Gerardo Del Real: Brien, well said as always. Thank you so much for your time, and we'll see you in a couple of weeks. Brien Lundin: You got it, Gerardo. We're looking forward to it.